Equipping your character was never so easy!! We've designed a series of playing cards that each sport a fully realized backpack for your favorite character (well any character really) in your favorite game (well any fantasy game really). Each playing card lists a backpack and its contents. Pick the backpack that best fits your character, deduct the cost from your treasure, and boom, you're equipped! Designed for use with any RPG. 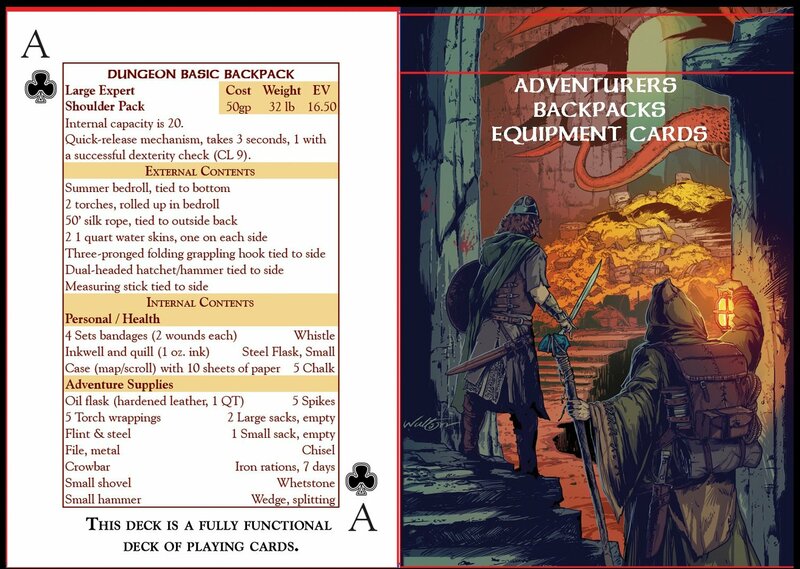 Each of the 52 playing cards comes with a list of special backpacks and all its contents. There are 34 different backpack cards. Each of the backpacks contains equipment designed for specific terrain, character classes or specialties. *Read here for more information on The Adventurers Backpack Book. The deck is also a fully playable deck of cards.